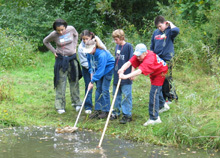 Students from Jefferson Junior High in Naperville study organisms living in water near the Lederman Science Center. Yesterday an army of 7th graders invaded the terrain surrounding Wilson Hall, looking for tadpoles and examining prairie insects. This group, led by Karen Doughty of Jefferson Junior High in Naperville, spent half the morning studying organisms living in the water near the Lederman Science Center. Their explorations fit into a larger "ecological interactions unit" that involves a week of preparations and ends with group presentations in science classes and reaction journals in language arts. Fermilab hosts local school groups five days a week, and Boy Scouts on weekends. (Teachers must attend a multi-day Fermilab workshop before bringing their students.) The activities, ranging in focus from bison to particle physics, depend on the season and the age of the kids. The trips are so popular that some schools book almost a year in advance. Last year, 7,000 students came to study the prairie in September and October alone. Doughty says, "They absolutely love it. Rain or shine we come. There's nothing like field study." What if the World Wide Web were one giant database, linking both human readable documents and machine readable data in a way useful to both mankind and machine? It would be the future of the Web espoused by Tim Berners-Lee, father of the World Wide Web and director of the World Wide Web Consortium (W3C). Since Berners-Lee and a few other leaders at the W3C first mentioned it in May 2001, that vision has increasingly become a leading focus of the W3C's work. They call it the Semantic Web. One of the most fundamental questions addressed by particle physicists today is the origin of mass. Theory holds that particles acquire mass by interacting with a field which permeates space. The unstable massive Higgs particle associated with this field can be produced in particle collisions at the Tevatron. will predominantly decay to W pairs. We observe the W particles from their decay into charged electron, muons, and neutrinos. DZero has used Tevatron Run II data to search for the Higgs in this decay mode. So far, no evidence for the elusive particle has been found. 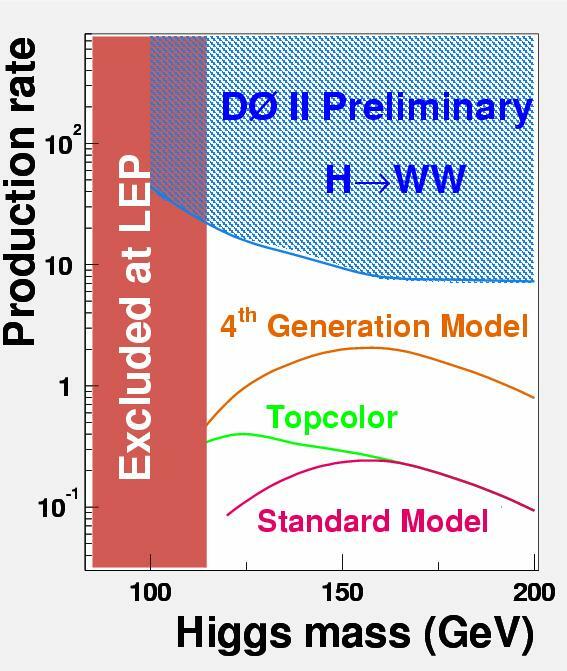 The plot shows the DZero limits on the production rate of the Higgs as a function of mass (blue) and compares that to the limits set at LEP (red) and the predictions of various models. Highlighting the international spirit of today's high energy physics experiments, most of this analysis work was conducted in Germany at the Universities of Munich and Mainz. Graduate students Johannes Elmsheuser, Univ. Munich (left) and Marc Hohlfeld, Univ. Mainz are working on Higgs searches. Fermilab invites scientists to participate in the International Workshop on Future Hadron Colliders, which will be held at Fermilab on October 16-18, 2003. There is no registration fee for attending this meeting. Join the strength training classes at the recreation facility. Tuesdays and Thursdays 5:30 p.m.-6:30 p.m.